Each fall, nearly 100,000 people hear the music of “The President’s Own” United States Marine Band as the band tours the United States. A century-old tradition initiated by John Philip Sousa, the band’s 17th director, the annual concert tour brings the Marine Band to communities throughout America. Those living in eastern Utah will be able to experience this tradition first-hand when the United States Marine Band performs in concert at College of Eastern Utah’s Bunnell-Dmitrich Athletic Center on Tuesday, October 19, at 7:30 p.m. The first Marine Band concert tour took place in 1891. Before that time, the band could be away from Washington, D.C., for no more than 24 hours because of the hectic schedule. Sousa’s repeated requests for permission to tour were denied. In 1891, however, the Secretary of the Navy approved Sousa’s request, and Sousa was directed to seek final approval from President Benjamin Harrison. In his autobiography, Marching Along, Sousa recalls what transpired: “My years in Washington had taught me that if you wish to see the President, see his wife first. So I asked for Mrs. Harrison. She liked the idea of the tour, and promised to speak to the President about it. The first concert tour in 1891 took “The President’s Own” to 32 cities and towns in New England and the Midwest. The band performed two different programs: one for matinees and another for evening concerts. Both included Sousa’s unique blend of popular music and orchestral transcriptions, as well as his own compositions. Although the audiences clamored for Sousa’s marches, he included them only as encores, offering his audiences what he called the “solid fare” of Wagner, Bizet, Verdi, Schubert, Berlioz, and others. Sousa launched the band’s second concert tour in 1892, this time through 37 cities to the Pacific Coast and back. When this tour proved even more successful than the first, Sousa decided to leave “The President’s Own” to form his own civilian band. After Sousa left the Marine Band in 1892, “The President’s Own” made only four tours – 1901, 1907, 1911, and 1912 – before traveling yearly between 1920 and 1931. The band suspended its tours during the Depression years of 1932-34, but took the road again in 1935 and continued until 1942. During World War II, the band played many additional performances in Washington, D.C., and at the White House to boost wartime morale. 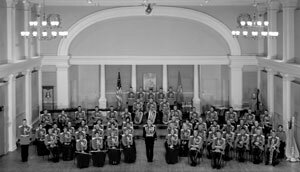 The Marine Band’s national concert tours resumed in 1946, and have continued every year since. Today’s Marine Band tours only in the fall, and rarely leaves the Washington area at other times because of a heavy schedule of White House and ceremonial commitments. The Department of Defense determines the geographic location of the Marine Band tour and has divided the country into five regions for the purpose of conducting tours by the premier bands of the Armed Forces. This allows each band to visit as many states as possible during a normal rotation without competing for the same sponsors and concert sites. The Marine Band Tour Director (a civilian employee of Marine Corps Headquarters) plans and schedules the concert tour. Marine Band tours normally begin in early October and last approximately 50 days. During this period, the band presents approximately 45 concerts, each in a different town. Conducted by Marine Band Director Lieutenant Colonel Michael J. Colburn, the band typically performs approximately 10 different programs during a concert tour, rotating the programs to best suit the concert venues. Following Sousa’s model, Marine Band tour performances offer a unique blend of traditional concert band and contemporary wind ensemble music that has thrilled audiences at the White House and across the United States. Tour personnel usually include the Director, Assistant Director, 58 musicians, Stage Manager, and a four-member stage crew, utilizing vans, full-size buses, and a tractor-trailer. Just as the tour personnel varies from year to year, so does the group that stays in Washington. The Marine Band tours at government expense. Transportation, meals, and lodging are the responsibility of the Marine Corps. A sponsor in each community presents the concert as a public service on an admission-free basis. Said Marine Band Director Lieutenant Colonel Michael J. Colburn, “While President Thomas Jefferson called the Marine Band ‘The President’s Own,’ Sousa referred to it as ‘The National Band.’ As its leader, Sousa realized the importance of sharing this national resource. The Marine Band’s October 19 concert at College of Eastern Utah will include traditional and contemporary works by Sousa, Shostakovich, Mantia, Piston, Gryc, and Mozart, as well as patriotic offerings. Those who would like to attend the performance may receive up to four free tickets by mailing their request and a self-addressed stamped envelope to: Marine Band tickets, College of Eastern Utah, 451 East 400 North, Price UT 84501.